Return to the main page. Return to Table 1 on the main page. 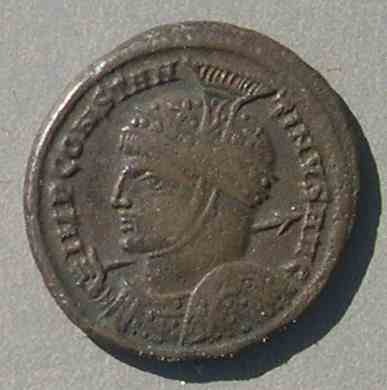 Coins of Table 1: Period of Constantine, to his death in to 337. Skip down to Type 1.5, 1.7, 1.8, 1.9 (VRBS ROMA), 1.10 (CONSTANTINOPOLIS), 1.11, 1.12, 1.13, 1.14. Are the symbols really Christian? 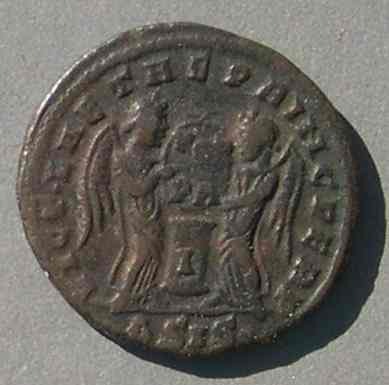 The main page on early Christian symbols on Roman coins illustrates some types that are undoubtedly Christian. But it is not so clear that every cross symbol is necessarily has a Christian reference. Our modern plus sign for addition, +, makes a cross but is not "Christian." If a type has a tiny + on some examples but commonly a C or I or M or R or dots in the same place on others, is the + Christian? Maybe, but maybe not. 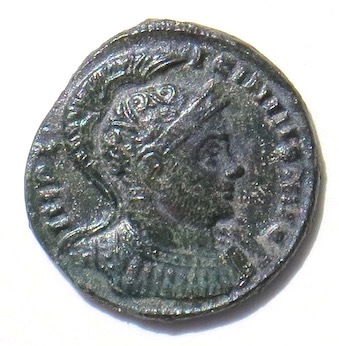 Late Roman coins often have symbols in the field or in exergue (thee region below the horizontal line on which the type stands) or within the type. There are eight-pointed stars, individual letters, pairs of letters, wreaths, crescents, dots, Roman numerals, branches, and leaves, none of which have been regarded as Christian. Under Constantine there are also six-pointed stars (possibly a monogram composed of "I X" for Jesus Christ--The Romans had no J and used I), square crosses without and with serifs (see the first type below), long crosses, Xs, chi-rhos, and cross-rhos, all of which have been interpreted as "Christian" by one author or another. Which are truly "Christian"? See the indivdual types below for comments. 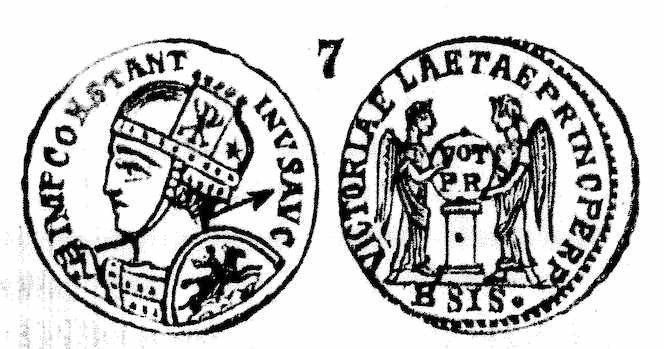 SOLI INVICTO COMITI (Companion of the invincible Sun god) Sol standing left raising right hand and holding globe in left. 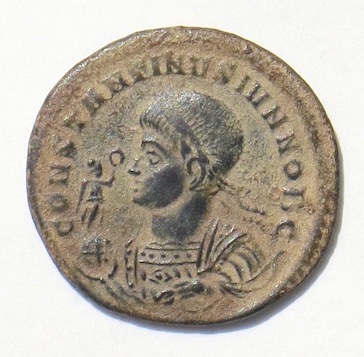 Note for collectors: The SOLI INVICTO COMITI type is extremely common. 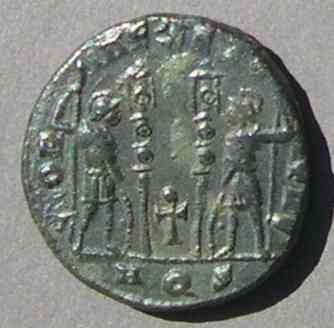 It was issued from numerous mints with a wide variety of symbols in the field left and right. Only the cross in the left field, which occurs only a Ticinum and only infrequently there, makes this variety special. This particular example has a very well-formed cross with clear serifs. Other examples show a cross with no more distinction than a plus sign: + (which did not exist as a symbol for addition until over 1000 years later). cross in field left, star in field right. 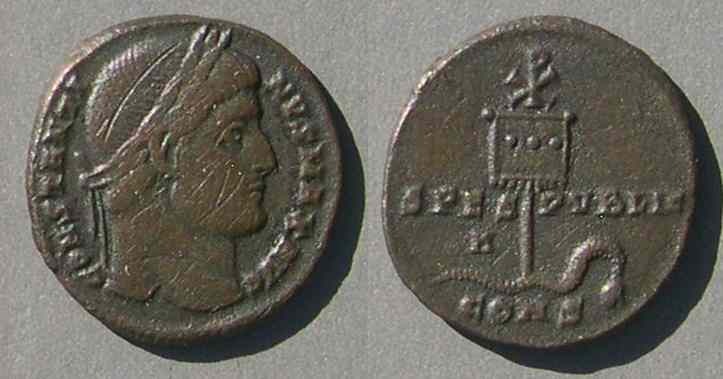 Licinius was not a Christian, so this cross is clearly an issue mark which applied to both rulers. Is it really a Christian cross, or just a cross as a control mark, but without intentional Christian reference? 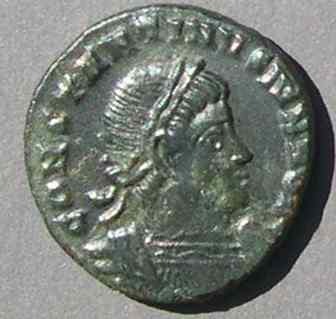 The basic type, SOLI INVICTO COMITI, is one of the most common Roman coin types. It appears at every mint of Constantine. But none of the other mints use a cross. Furthermore, even at Ticinum the type more commonly comes without a cross and with various letters. This demonstrates that it was not policy of the emperor's administration, or even the mint administration at Ticinum (or anywhere else) to put Christian symbols on this issue. However, locally at Ticinum there are subsequent issues (Type 1.5 below) with crosses. 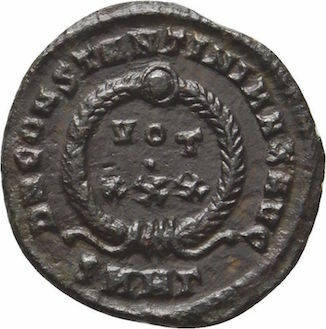 The appearance of this symbol at this time suggests that at there was a Christian at the mint in a position to choose to include a Christian symbol as a control mark. Type 1.1 is not just a bare + sign--it has carefully done serifs which look like a very intentional cross. I agree with Dr. King that it was one sign chosen from a repertoire, but think that the repertoire was at that time, for the first time, expanded to include a Christian symbol and this symbol was chosen because it was Christian, probably by someone at a rather low level in the mint who nevertheless picked the next control mark in the sequence. 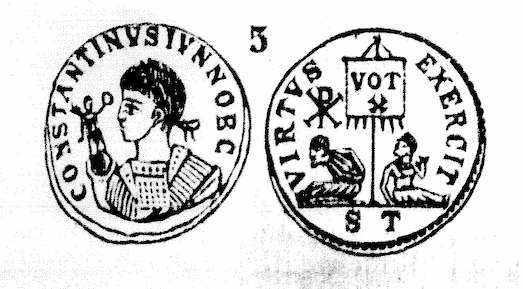 The "type" is very far from Christian: SOLI INVICTO COMITI (Sol [the sun god], invincible companion), but the field sign (control mark) probably indicates there was at least one Christian at the mint. Note for collectors: The MARTI CONSERVATORI type is common and occurs with a variety of control marks. This variety with cross in the upper right field is rare and from the same mint and issue as Type 1.1 above. 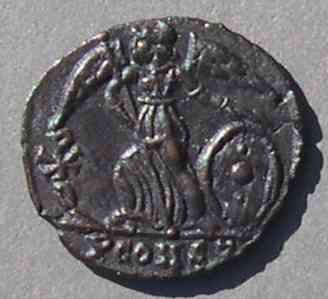 Obverse: Bust left, with spear and shield. Crested, close-fitting helmet divided into three parts by a band through the middle at the ear. This type is distinguished by the symbols, possibly crosses, in the front and back thirds. 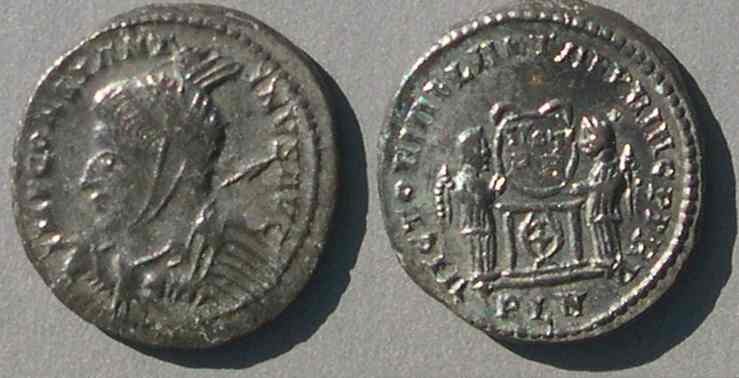 This "two Victories" type was minted for Constantine, Crispus, Licinius I and Licinius II with a wide variety of minor symbols on the helmet. Is the cross just one among a selection of meaningless decorations, or it genuinely a Christian reference? Unlike types 1.3 and 1.4 below, the symbol on this type is never well-done. It is not convincingly Christian. It is not at all clear that those cross-like symbols are actually Christian symbols. 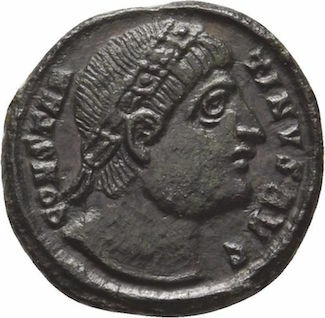 Many coins of this basic type have helmets decorated with swirls or other symbols with no Christian connection. In my opinion, those are just helmet decorations and not Christian symbols. Note for collectors: This variety is extremely rare and highly sought after. A few years ago one was offered at $6000. Type 1.5 is distinguished by a cross on the column. 18 mm. 2.74 grams. 6:00. The cross, although only a small part of the design, looks very intentional with bold serifs. 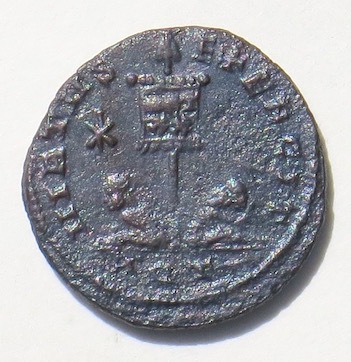 This coin, from the London mint, has a "column" which looks much like a table and the cross is in a wreath and neither as bold nor as clearly intended to be a cross. It has no more detail than a plus (+) sign. This is a very common type, rarely with a cross on the column. 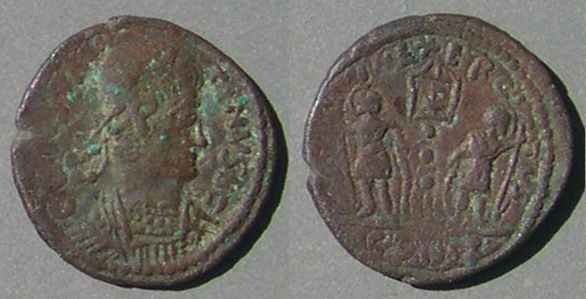 This "two Victories" type was minted for Constantine, Crispus, Licinius I and Licinius II with a wide variety of minor symbols on the column. Is the cross just one among a selection of meaningless control marks, or it genuinely a Christian reference? The cross on the first example is convincing and probably intentional. The "+" on the second one may or may not be a subtle Christian reference. Note for Collectors: The variety with a bold cross is scarce, but is often available and usually does not bring a huge premium. It might cost three times the cost of an example without a cross. Type 1.6 has a six-pointed star in the field left. It might be a monogram made from I (Jesus-- the Romans used I for our J) and X (Christus). Some think might just be a six-pointed star. The Christian reference of this type is not certain, but likely. Maurice (in Numismatique Constantinienne, volume I, page 323) says the Iota-Chi is the earliest Christian symbol found on Christian funerary monuments. Some, like the first one illustrated, have a bump at the top which usually seems to be centered, as opposed to the top of a "P". A clear chi-rho, if it exists, must be very rare. I know of two very experienced experts who have not seen one. 19-18 mm. 2.05 grams. 5:30.
or any indication a Rho was intended. 18 mm. 2.48 grams. 5:30. 18 mm. 2.62 grams. 11:30.
who was clearly not Christian. 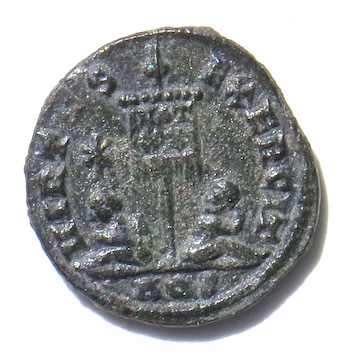 It is not certain that there really is a coin like this with a clear rho. If you have evidence it exists, please contact me. 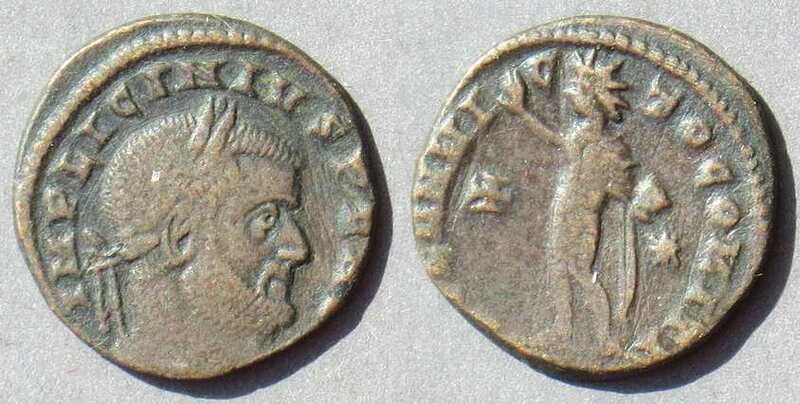 Type 1.7 is distinguished by the entire reverse, which is unlike any other reverse in the entire Roman series. This type is discussed on this page. 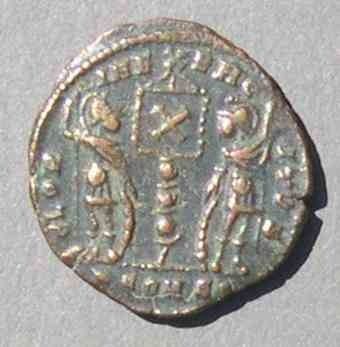 This coin is ex Langtoft II hoard, coin 136. I believe the chi-rho on the shield was struck only for Crispus, possibly from only this one die. 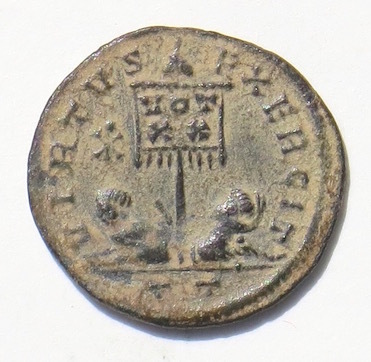 Note for collectors: This variety is excessively rare and the only variety to illustrate the chi-rho actually on the shield as Lactantius said occurred at the Battle of the Milvian Bridge. As such, it is extremely historical and highly desirable. Type 1.9 is distinguished by a chi-rho between the two stars above the wolf. This piece ex Bicester (Oxon) hoard. 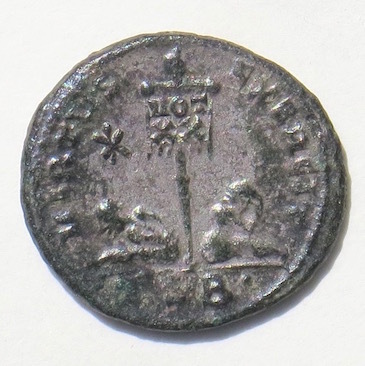 Note for collectors: The VRBS ROMA type is extremely common, but this chi-rho variety occurs only at Arles (with SCONS... mintmark) and only on some examples from that mint. It is probably worth five times as much as a comparable example without the chi-rho. Type 1.10 is disntiguished by a chi-rho in the left reverse field. 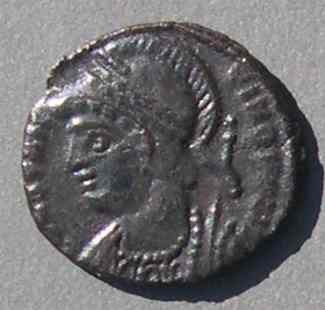 Note for collectors: The CONSTANTINOPOLIS type is extremely common, but this chi-rho variety occurs only at Arles (with SCONS... mintmark) and only on some examples from that mint. It is probably worth five times as much as a comparable example without the chi-rho. Type 1.11 is distinguished by a chi-rho high between the two standards. Two soldiers and two standards, with chi rho high between them. 18 mm. 2.40 grams. 11:30. 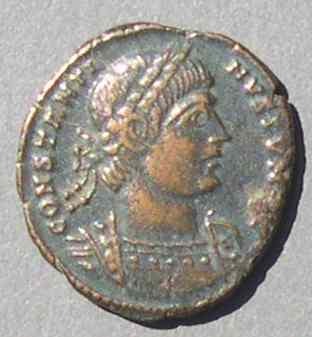 Note for collectors: The GLORIA EXERCITVS type is extremely common, but this chi-rho variety occurs only at Arles (with SCONS... mintmark). Numerous examples have some symbol (a palm branch or a tree-like symbol) between the two standards, but a chi-rho between them is extremely rare. 17-16 mm. 2.68 grams. 6:00. RIC Arles 382 "r5"form only this one officina. Type 1.12 is distinguished by a long cross low between the two standards. 17 mm. 2.17 grams. 12:00. 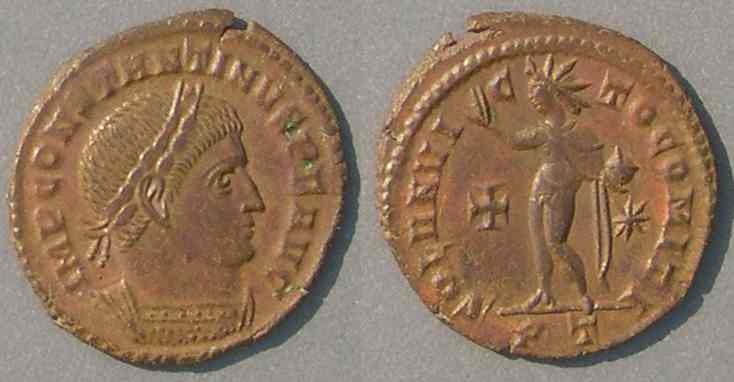 Note for collectors: The GLORIA EXERCITVS type is extremely common, but this long-cross variety occurs only at Aquileia. It is very rare and seldom offered (r3-r5 in RIC). It comands a significant premium (even though it is not well-known). 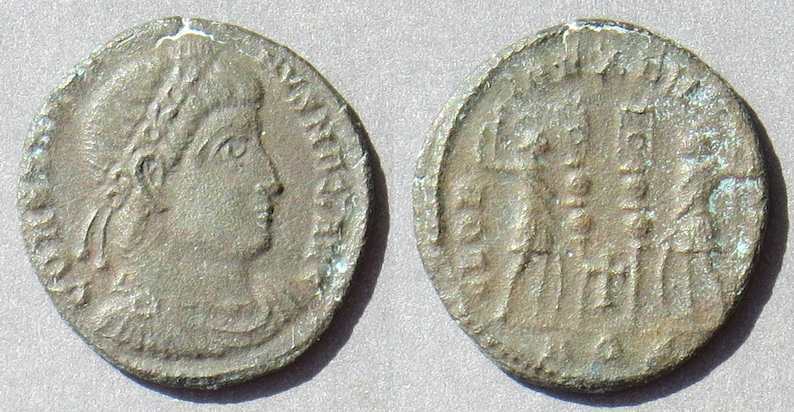 I have seen more examples for Constantine II than the other rulers, but that may just be by chance. 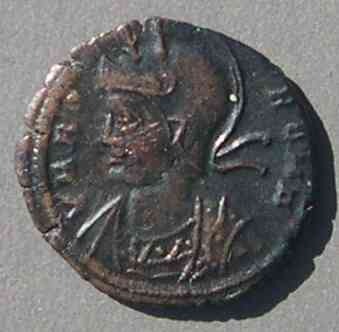 Struck only at Constantina, the name at the time of the mint city now called Arelate (Arles). 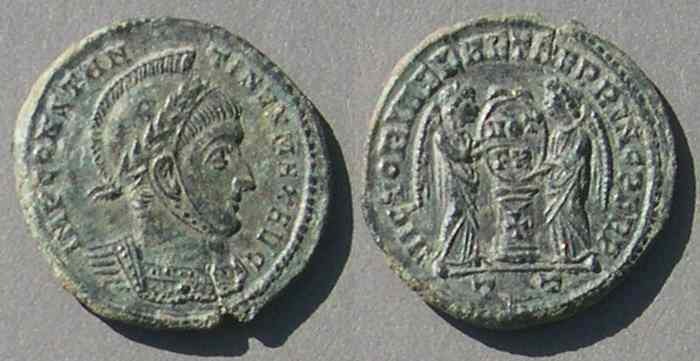 Struck in the names of Constantine, Constantine II, Constans, Constantius II, and Delmatius. 16 mm. 1.46 grams. 12:00. Note for collectors: The GLORIA EXERCITVS with one standard type is extremely common, and not unusual with a chi-rho on the standard. 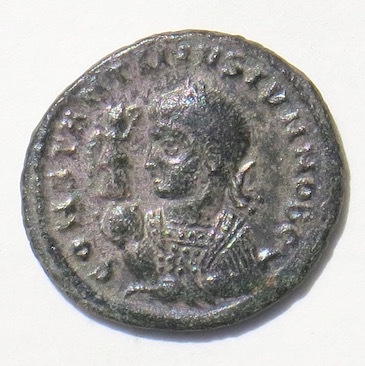 Be sure to distinguish this type struck at Arles (SCONST) before the death of Constantine from the later, similar, type from Siscia which is demonstrably struck after the death of Constantine (Type 2.1). It is scarce to rare. Nevertheless, it sometimes sells without much premium, perhaps because the difference is not well-known. Type 1.14 is distinguished by an "X" on the standard. Reverse: Two soldiers, either side of one standard with X (St. Andrew's cross, possibly) on standard. 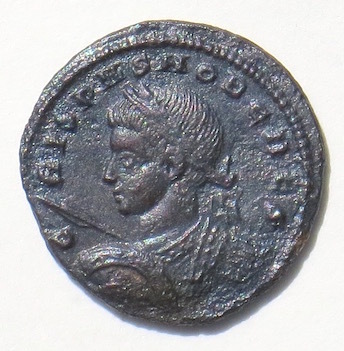 Note for collectors: The GLORIA EXERCITVS with one standard type is extremely common. 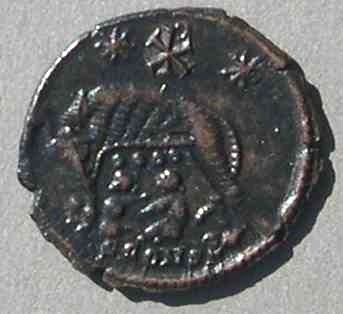 This variety, only from Arles, with an "X" on the standard is very rare, but not certainly "Christian," although Arles is associated with other symbols likely to be Christian. If this variety is Christian, it is too obscure to have garnered much attention. Type 1.15 is distinguished by the head's tilt backwards which allows him to look upwards towards heaven. 19 mm. 3.16 grams. 6:00. Victory seated left, head right "eyes to heaven"
There is no Christian "symbol" on this type, but the "eyes to heaven" head is new at this time period and recognized in antiquity as related to Christianity. This type is worthy of discussion in two distinct ways. The "eyes to heaven" look is remarkable and has Christian reference, and the reverse type referencing DAFNE is unique to Constantine.